By saying “superior to all else” he is not implying, “No one can do this service but me; I will not allow anyone else to do it.” My Srila Gurupadapadma’s nature contains no such violence. Glorification and prayers are included in sankirtana. From an external perspective, one who offers stuti (Vedic prayers) holds a lower position than the object of the prayers. A third party however, can best understand the glories of a person by hearing his prayers. Sri Gaurasundara explained that to genuinely call out for Bhagavan, one has to more humble than a blade of grass (trnad api sunicena). We cannot cry out for someone until we have accepted our own insignificance in relation to that person. We beg for assistance when we are forced to acknowledge our helplessness. Whenever we find ourselves incapable of completing a task on our own, we are left with no choice but to seek another’s help. Alone I cannot complete a task that requires five people to accomplish. Sri Gaurasundara has instructed us to genuinely cry out for Bhagavan, which means He has urged us to solicit Sri Bhagavan for help. This we have heard from Srila Gurudeva. However if I cry out to Him with the intention of involving Him in service to me, or if I petition Him for the purpose of accomplish ing any task, my cries lack the real humility of trnad api sunicena. Real humility is never found in an external show of humility, which is actually mere duplicity. Calling out to Bhagavan in the mood of being His master, expecting Him to obey like a servant, is ineffective. He does not hear such a call because He is supremely independent and fully conscious. Consequently, He is not controlled by anyone. Until a person’s egoism establishes roots in sincere, non-duplicitous humility, his prayers will not reach Bhagavan, who is fully independent. If we are excessively vain, we cannot properly call out to Him. And also if we try to annihilate our real self-interest, then we will not be able to cry out to Bhagavan properly. Often, I think that I am obliging Him by my prayers, and therefore I engage in other activities in which I don’t need to ask for His help. This mentality also indicates the absence of tolerance. Serving the lotus feet of Srila Gurudeva is our foremost necessity. In this world, we even need a guru to perform karma(material activities), to acquire jnana (knowledge) or to fulfill any anyabhilasa (desires not connected to serving Krsna). The guidance of such worldly gurus engenders insignificant results, which are the antithesis of the results bestowed by the lotus feet of a bona fide guru. Srila Gurudeva is the source of our genuine welfare. The very moment we become bereft of his mercy, diverse worldly desires manifest in our hearts. 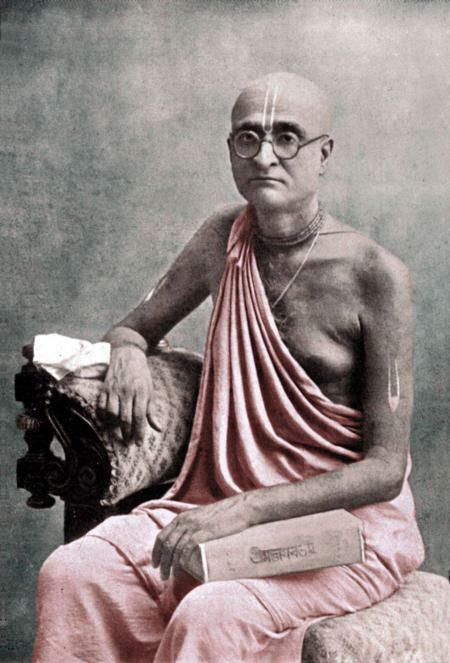 And if the vartma-pradarsaka guru, who is the first to tell us about spiritual life, does not tell us how we should take shelter of the lot us feet of Srila Gurudeva, we may end up losing the gem in hand. In a realm that is concealed and mystifying, it is impossible to proceed by depending on one’s own multitude of competencies. Just as it is impossible to foresee the future or making plans for the future on the strength of one’s own ability, similarly, mundane conceptions cannot help one penetrate or attain the supra-mundane realm. My senses have experience something of the time that has already passed, and therefore I have knowledge of it, but I remain ignorant about the future. In the same way, our current senses are incapable of informing us about that realm that is complete and inconceivable. Our eyes can only see a few miles into the distance, and our ears can only hear words spoken nearby. If we depend on our own competence to proceed in such a realm, we will never reach the far end, the Ultimate Reality. Such an attempt is likened to Ravana’s efforts to build a stairway to heaven. Construction may begin, but it will eventually crumble to the ground. It cannot exist in a void where no support is present. Similarly we desire to ascend to that unknown realm, and we try to do so on the strength of our own competence, but we always fail. Furthermore, if we consider an ordinary mortal who is laghu (spiritually impotent and not at all grave) to be guru (weighty with potency), we face failure. Our Gurudeva’s forms are manifold. If he did not manifest himself in various ways, then who else would protect us? That person whom my Gurudeva has accepted as his own i s my saviour. I do not want to see the faces of vile persons who criticize my Gurudeva or who support those who criticize him. They are the cause of all inauspiciousness. Our spiritual masters (asraya-jatiya guru-varga) are the abodes of love. They appear to us in different forms to bestow their mercy upon us. They are reflected in all objects and in every entity. Indeed, they are the special manifestations of Srila Gurudeva, he who imparts divya-jnana, transcendental knowledge. The object of love, Krsna (visaya-jatiya), is one half of the equation, and the abode of love, Sri Guru (asraya-jatiya), is the other half. Their combination results in a complete whole through vilasa vaicitrya (wonderfully variegated pastimes). Sri Krsna is the complete manifestation of the object of love, and Srila Gurudeva is the complete perception of the abode of love. When the transcendental reflection of asraya-jatiya tattva falls upon any conscious being, he is to be understood as a manifestation of my Gurudeva. Gurudeva is that person whose behaviour at every moment instructs us that our entire life is meant for serving Bhagavan. That very Gurudeva is reflected in the heart of every living being and is situated in every entity as asraya-jatiya tattva. If a person is blessed with the darsana of Sri Guru in his heart, or if he makes a place in his mind where Sri Guru can wander, then such pastimes are revealed in his heart. The one and only way to attain service to the Complete Being is to worship that person who, by his every activity, encourages us to serve the Complete Being. Our Gurudeva’s image, reflected in many different ways, constantly manifests newer and newer lessons for us. Once I went to Mangala-giri in South Ind ia to establish the sacred impressions of Sriman Mahaprabhu’s footprints. A devotee amongst us raised this doubt: ‘When I first came to the matha, I noted the character of the matha residents and their attachment o serving Bhagavan. This impressed and inspired me and I cherished a high aspiration to be like them. But now, the standard I once envisioned attaining has lessened considerably. 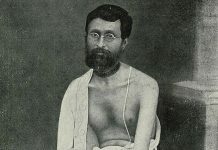 I am engrossed in various mundane thoughts such as thinking about the many brahmacaris who have turned to their homes and entered household life. From my perspective, everybody is advancing in hari-bhajana, and this universe, which was created by Bhagavan, is prospering in every respect. Everyone except me is receiving spiritual benefit. You have become restless without due reason, and because you are intensely eager to serve Bhagavan you want the devotees who left to also be increasingly keen to engage in hari-bhajana. They are, however, engaged in hari-bhajana. Still you are dissatisfied and want their exuberance to serve their beloved Lord to increase a million-fold. My heart, on the contrary, is meager and unable to accommodate the magnitude of their bhajana of Sri Hari. They exemplified living according to an astonishingly high ideal. The only person who is incapable of performing hari-bhajana is me, because I busy myself with finding faults in others. How, then, can I ever make progress? Who finds faults in the Vaisnavas? Those who depend on their senses to acquire knowledge. Their senses the eyes, ears, nose and so forth are their sole support; hence external objects deceive them. In other words, those who are averse to hari-bhajana find faults with the Vaisnavas. When a person tells me that someone has stopped chanting his harinama, I think, He must have become highly elevated at heart as a result of so much chanting. This is why he has left the path of bhajana, which is the sole source of one’s welfare, and become engaged in other activities. Only a rich man is so content that he does not care to earn more. In Srimad Bhagavad-gita, Bhagavan says: ‘na me bhaktah pranasyati ‘ My devotees never perish or face misfortune. If I depend on my sense-perception for information I will remain deprived of service to the Lord, who is beyond the perception of the senses (adhoksaja), and of Srila Gurudeva. I have not attained my own welfare, but still I meditate on the auspicious behaviour of others, and although I myself am full of shortcomings, I am enthusiastic to find faults in others. If I ever began to really focus on my own welfare, would I have time to observe another’s imperfections? nindadi sunya-hrdam ipsita-sanga-labdhya[‘One who chants Krsna’s name just once is a neophyte devotee (kanistha-adhikari). One should consider him to be his family member and silently respect him. One who, fully understanding the principle of diksa, has accepted initiation from a qualified guru and performs bhajana of Bhagavan in accordance with Vaisnava conventions is an intermediate devotee (madhyama-adhikari). One should respect such a devotee who is endowed with the correct understanding of reality and illusion by offering him pranama and so forth. One who is adept in the science of bhajana as described in Srimad-Bhagavatam and other Vaisnava scriptures, and who performs exclusive bhajana of Sri Krsna, is a maha-bhagavata devotee. Due to his undeviating absorption in Krsna, the pure heart of such a devotee is free from faults such as the tendency to criticize others. He is expert in bhajana, meaning that he mentally renders service (manasa-seva) to Sri Radha-Krsna’s pastimes which take place during the eight segments of the day (asta-kaliya-lila). Knowing him to be a topmost devotee whose heart is established in the particular mood of service to Sri Radha-Krsna for which one aspires, and who is affectionately disposed towards oneself, one should honour him by offering dandavat-pranama, making relevant inquiry and rendering service with great love. The slightest tendency to find faults in others is completely absent in Srila Gurudeva. At the same time, his sole function is to kindly point out our hundreds and thousands of faults, which are the cause of our misfortune. May we not lose sight of this quality of Srila Gurudeva. If I live for one more year, then I will absorb myself in the service of Gurudeva at every moment from today onward and give up my tendency to criticize others. I will not say, I am valorous, scholarly and a gifted speaker; he is foolish, ignorant and cannot express anything. On the strength of exclusive absorption in hari-katha, I will not foster an attitude of aversion to Bhagavan, and thus I will become truly benefited. pranairvrajena ca varoru vakarinapi[O Varoru (girl with beautiful thighs), I am passing my time with the sole hope of being able to serve You. If You withhold Your mercy, what value to me are this life, the land of Vraja, and Sri Krsna, the enemy of Baka? Some people ask me, ‘Why don’t you give siddha-pranali (the identity of one’s eternal relationship with Krsna)? However, I cannot understand how a sadhaka and a siddha can be on the same level. How can one in the stage of sadhana that is full of anarthas cultivate the activities of sadhana that is free from anarthas or that of siddhi (the stage of perfection)? If someone is siddha, self-realized, and he mercifully reveals his svarupa to me, then only can I come to know his eternal constitutional form. In madhura-rasa Srila Gurudeva is Varsabhanavi (Sri Radha). According to a person’s eternal nature, he will see that same Sri Gurudeva as a certain absolute reality (vastu). One in the mood of a parent sees him as Nanda-Yasoda; one in the mood of a friend sees him as Sridama-Sudama and one in the mood of a servitor sees him as Citraka-Patraka. The truth of who is visaya and who is asraya appears in the heart of one who remains engaged in service to Srila Gurudeva. This truth does not manifest in the heart by an artificial means. When the tendency to serve arises in a fortunate soul, this truth automatically appears in his heart. We are not obliged to serve anyone other than our Gurudeva. The nature of nitya-lila (Krsna’s eternal pastimes with His devotees), which even Sesa, Siva, Brahma and others cannot conceive of, will never be realized by one whose consciousness is polluted with mundane conceptions. Previous articleHave I Made a Mistake?